The HP Procurve 3800 series is designed with efficiency and flexibility in mind. 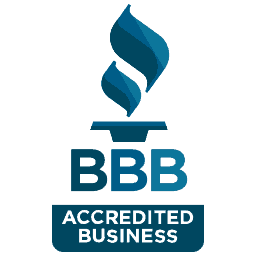 It has been engineered with reliable hardware and traffic prioritization capabilities. The Procurve line offers a variety of features to match your requirements. 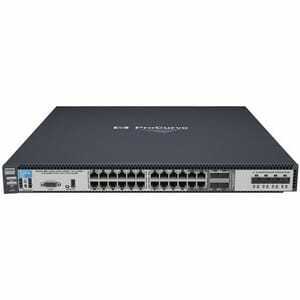 The HP Procurve 3800-24G-2XG 24 Port GbE /2 port 10GbE is a rack mountable ethernet switch. It offers layer 3 switching capabilities with low latency. This 3800 model offers a user-friendly interface for advanced technologies. 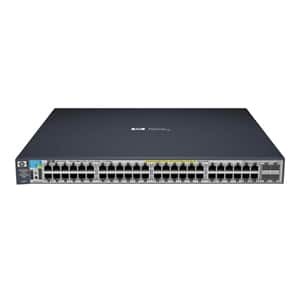 This switch series is the perfect way to optimize your network. HP is one of the mosted trusted networking brands and offers a range of solutions for your business. Call us to learn about which series and model is right for you. The HP 3800 Switch Series provides performance, resiliency, flexibility, and ease of use for enterprise edge, SMB and branch office deployments. Full Layer 3 switch series for flexible deployment with 24 or 48 Gigabit Ethernet ports plus convenient built-in 10GbE uplinks (10GBASE-T or SFP+), PoE+, Energy Efficient Ethernet, and hot-swappable, redundant power supplies. Mesh-stacking technology delivers modular chassis-like resiliency in stackable1U form factor with optional stacking modules. License free software with advanced Layer 2 and 3 feature set including IPv4 BGP, policy based routing, IPv4/IPv6 OSPF, and robust QoS. 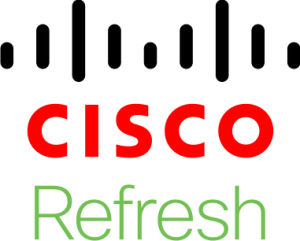 Software-defined Network (SDN) ready with OpenFlow 1.3 support for future proofing your network. 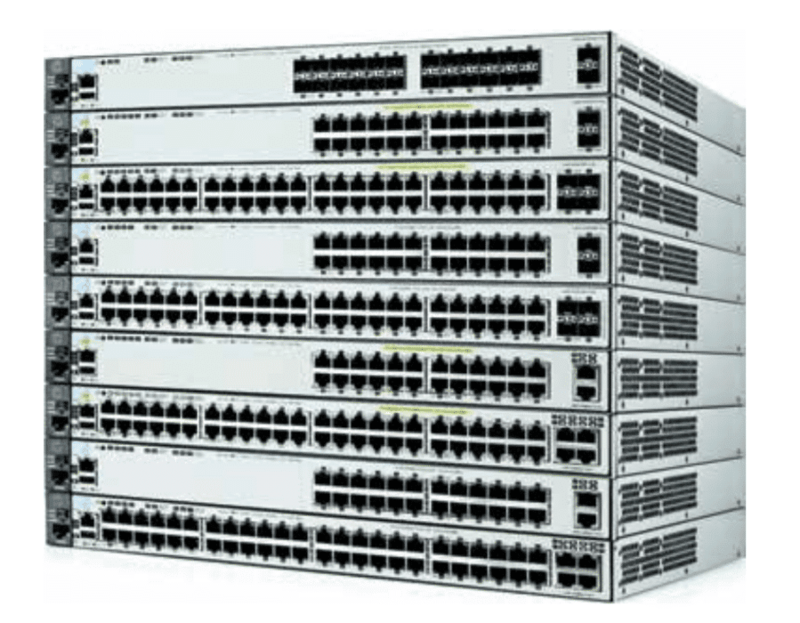 The HP 3800 Switch Series uses a powerful HP Networking ASIC providing very low latency, increased packet buffering, and adaptive power consumption. Meshed-stacking technology delivers high-performance stacking with up to 336 Gbps of throughput and increased resiliency. As many as five 3800 switches can be stacked in a mesh topology and then an additional five can be arranged in a ring. Selectable queue configurations enables increased performance by selecting the number of queues and associated memory buffering that best meet the requirements of the network applications. 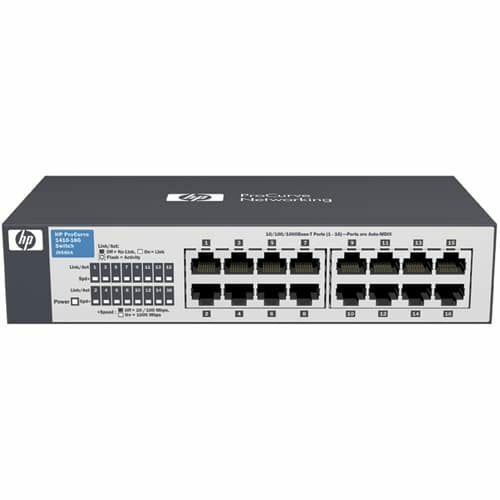 The HP 3800 Switch Series supports virtual router redundancy protocol (VRRP) allowing groups of two routers to dynamically back each other up to create highly available router environments in both IPv4 and IPv6 networks. Dual hot-swappable power supplies provide uninterrupted power and allow swapping of modules on the fly to reduce impact on the network availability. Provides up to 1080 W PoE+ power. 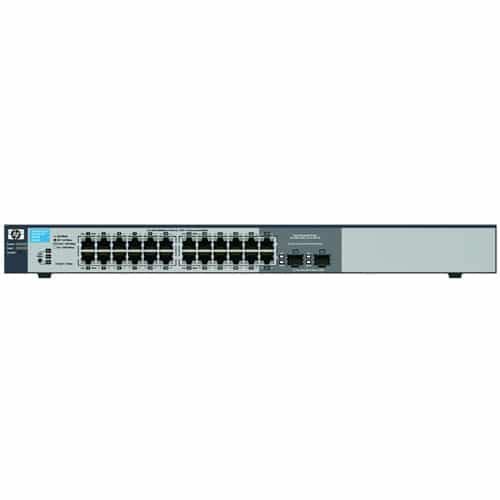 The HP 3800 Switch Series includes a robust set of security and QoS features to build a network that meets ever-changing corporate policies and compliances. Flexible authentication options include Local MAC, 802.1X, MAC and Web modes for greater policy-driven application security. Advanced distributed denial of service (DDOS) protection-such as DHCP Snooping, IP Source Guard, and ARP Protection-flexible traffic control programs, policy-based routing, QoS, and ACL, manage end-to-end application priorities. Powerful multilevel-access security controls, such as varying security management login, RADIUS/TACACS+, and SSH increase security and control change management access. The HP 3800 Switch Series can be seamlessly managed with HP Intelligent Management Center (IMC) software to provide end-to-end network transparency with consistent network experience through comprehensive configuration, compliance and policy management. The HP E3800 Switch Series is a family of fully-managed Gigabit Ethernet switches. 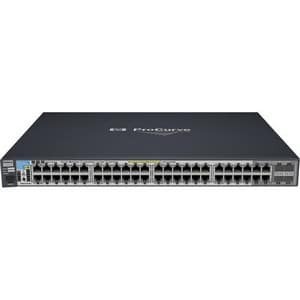 There are a total of 9 switch models - 24 port, 48 port, 24 port PoE+, 48 port PoE+ with either SFP+ or 10GBase-T uplinks and a 24 port SFP with 2 SFP+ uplinks. 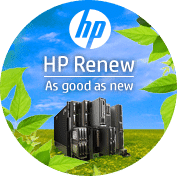 HP E3800 Series Switches utilizes the latest HP ProVision ASIC technology and combines the latest advances in hardware engineering to deliver one of the most resilient and power efficient switches in the industry. The E3800 implements the meshed stacking technology to deliver chassis-like resiliency in a flexible stackable form-factor.